Right now, I am tired, I smell, working off the cold numb feeling in my extremities and so effervescently happy, I cannot control it. I spent the night sleeping in a life raft tent at the Occupy Cork campsite and participating in their long-term demonstration in Cork City Center. The Occupy Cork campsite has been called the most organized and well-kept site in Ireland with a full-time voluntary security team. It is a drink free, drug free, violence free space. There is no political party associated with the site and is run entirely by the people. There are all kinds of people there, all kinds of backgrounds, nationalities, creeds, race, religions, but we are all there for one thing and that is to return the power to the people. The Occupy Cork site is established in a small public park in town center on South Mall Street where Grand Parade ends. It is in a place where many people walk by and see the demonstration. The Occupiers are incredibly friendly and welcome anyone to come in and have free tea, coffee, cake, ask any questions they have about the movement or simply have a nice chat or a tune on the guitar. Local establishments and citizens have been wildly generous with donating food, resources, supplies, specialized skills, time and emotional support. People are eager to help out in any way they can, even if they themselves are not available to be a permanent Occupant at the site. 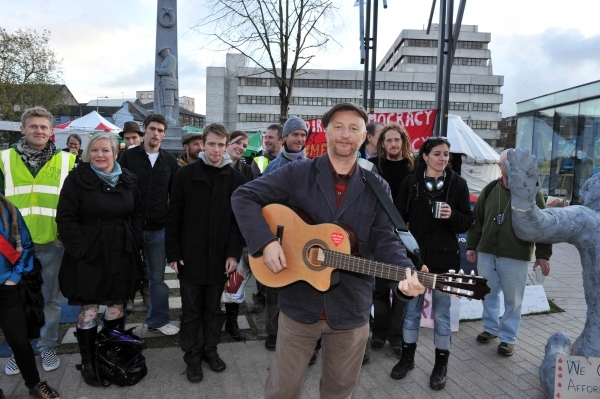 I myself took my guitar down and gave a small informal concert simply to give the Occupiers something to lighten their spirits, as they daily work against the elements and the misunderstandings and for the positive vision and hope they have for this country and the world. The purpose of Occupy Cork as well as Occupy Wall Street and most of the worlds thousands of Occupy campsites, is to bring awareness to the fact and protest against corporate banks being bailed out with government money and cutting the funds of worthy institutions such as hospitals, schools, fire stations, support for the unemployed and disabled, special education, the list goes on. Private corporate banks have far too great a hand in the direction of today's government and politics, they shouldn't have a hand in it at all, in fact. Happily, Occupy Cork has faced no violence from either the public or the Garda, unlike other Occupy sites, which have not been so lucky such as Occupy Oakland in California. But we are being watched. And that is, more or less, the point. The Occupation is a physical demonstration that the people, the ninety-nine percent being increasingly neglected by its government, still exist and we will not put up with being tossed aside so that Banks can be bailed out by the government for their own mistakes with the money we invested in their institution and the money we pay taxes for. We, as citizens in either Ireland or America or any country dealing with this dilemma, don’t see a cent of the bailout money. It goes into corporate hands. The Occupy Movement is important for all people across the globe who want change and want to see their money put to good use. I chose to visit and participate actively in Occupy Cork not simply because I happen to live here, but because I am a citizen in a world that is being controlled by a small percentage of the earths population and that is not acceptable. I believe if one of us succeeds the rest will find hope in it, and a positive reaction will occur. Were I at home, I would be a part of my local movement. Were I in New York, I would stand in Wall Street. Were I near any of the thousands of Occupy sites around the globe, I would be there to support them and support the vision and determination to change this situation for the better. Many misconceptions are out there about the Occupy movement. I commonly hear the phrase, “free-loading hippies” thrown around a lot. But, that is hardly the case. On any given day the site will be visited and inhabited by any number of people; from businessmen, students, families, the employed and the unemployed, musicians, teenagers to tourists. There is no limit on the kinds of people one will see in the camps because there is no limit on the kinds of people this issue has affected. Personally, I am very proud to be actively a part of something I believe can make a permanent and positive effect on ours and our children’s future. Just this week a teacher took his class of seven year olds and their parents in to the Allied Irish Bank (AIB), which was given a 700 million Euro (around one billion America dollars) bailout, to teach the children what was going on and share in a demonstration. The Garda were called by the bank...simply because kids were in their lobby being educated about the bank bailout, which directly affects the funds going towards their education!! Luckily the Garda were friendly about it and simply asked when they would be leaving the bank. But, the fact that a bank can feel threatened and throw out a bunch of kids who are being given an education on financial proceedings in their country is outrageous and a sign that priorities do not lie where they should. I am actually uncomfortable sitting here in my apartment now and had a difficult time tearing myself away from the site early this afternoon when I finally left. Not only is this a cause I desire to support full-heartedly, it is a community of loving and selfless individuals who are sacrificing their time and energy for a brighter and better future. There is hope in their hearts that burns like fire and a belief that this world should and can have a better future than the one that is currently being projected. I will be at this camp as much as I can until my departure in December. I know I will be sad to leave such a beautiful group of people whose passion has rekindled my own but, I will take that fire and share it with the world, as a beacon of hope.